Oh how I love the first Thursday of the month around here…because it’s 30 Minute Thursday time again! 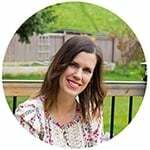 In case you are new to it, a group of my favorite bloggers and I bring you a whole lotta easy week-night dinner inspiration in the form of 30 Minute dinner recipes! And really, 30 minute dinners are kind of my jam. They have been happening a LOT at my house lately. That’s because I’m working on a recipe e-book filled with Healthy 30 Minute Dinner Recipes, and I’ll be sharing a sneak peek with you all soon! For now, I hope this big bowl of deliciousness will do! 30 minute dinners are funny. Sometimes they are more effort than you bargained for. I feel like some 30 minute recipes have me running around the kitchen like a chicken with my head chopped off and afterwards the kitchen looks like it was hit by a tornado. As in: it’s kind of a challenge to pack in all of the prep work and cooking in 30 minutes. Not this quinoa bowl. 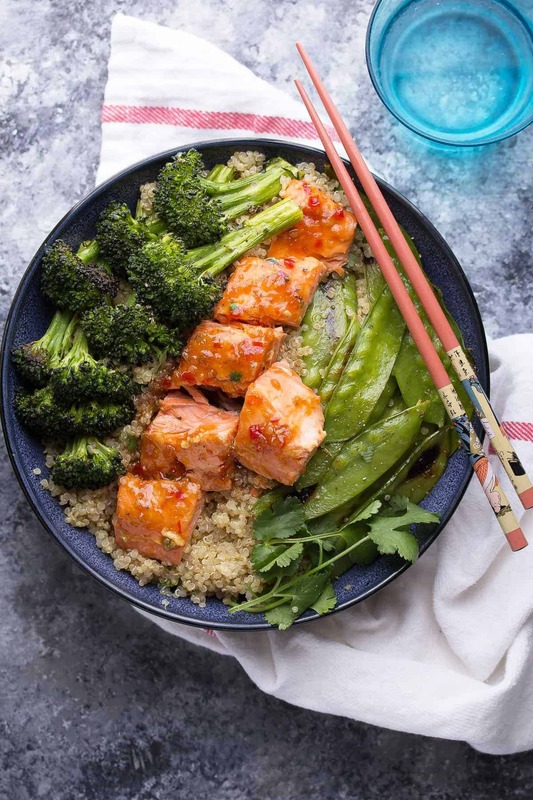 It is easily ready in 30 minutes, and you will actually have down time while the salmon, veggies and quinoa cook. You heard me right! Down time! 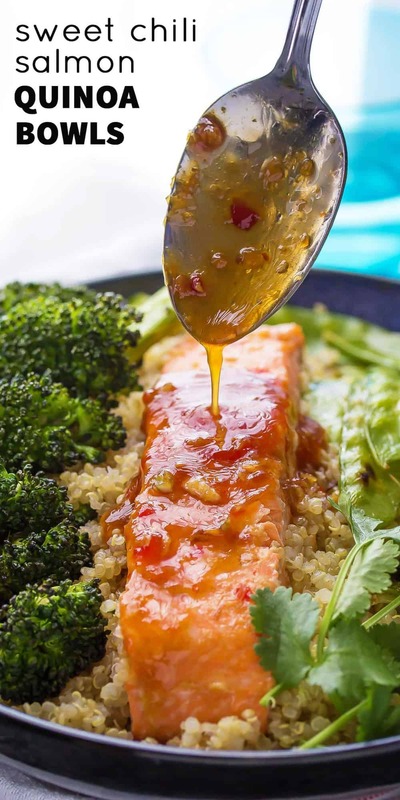 The salmon is baked in a sweet chili- soy sauce mixture. It’s bit sweet and a bit savory, and SO perfect with the salmon! The broccoli and snow peas roast away in the oven with the salmon. Have you tried roasted broccoli? It has so much extra flavor and is SO delicious, that it might even make a broccoli-hater into a broccoli-lover! Anyway, the roasted broccoli and salmon are served over quinoa (which I cook in my rice cooker) and drizzled with extra sweet chili sauce. It is a simple, quick and healthy recipe that is perfect for a busy week night. While quinoa is cooking, heat oven to 425°F. Line a large baking sheet with parchment and set aside. Whisk together the sweet chili sauce, soy sauce, water and garlic. Pour into a 8x8 inch baking dish. Place the salmon, skin side up, on the sauce. Allow to sit while oven heats. When oven is heated, place in the oven and cook for 15-20 minutes, or until cooked through. Place broccoli and snow peas in a large bowl. Toss with the olive oil and soy sauce, until lightly coated. Place in the oven and roast for 10-15 minutes, until cooked through and tender. Spoon extra sauce from the pan over the salmon and quinoa. Wonderful dish that was quick and easy. I just made this for dinner today after getting sweet chili sauce at Trader Joes. It is super easy and yummy! Looks delicious. Making it tonight. But I’m not a snow pea fan 🙁 what would be a good substitute?? Hi Cindy! You could use almost any other veggie…asparagus or bell peppers would work great, I think! I hope you like it! Thank-you so much for your comment, Kathryn! It really made my day 🙂 It is so hard to find the motivation to pull together a meal when you’re exhausted…I used to think my cooking style was ‘lazy’ but then I realized it’s actually ‘practical’, ha ha! I hope you find some recipes you like! Looks yummy! Do I place everything on the baking sheet before I put it in the oven or leave the salmon in the baking dish and the veggies on the baking sheet? Hi Hannah! I baked the salmon in an 8×8 inch dish, to keep the sweet chili sauce confined, and the veggies on a parchment-lined baking sheet. I would worry that the sauce would run everywhere if you put the salmon on the baking sheet? No problem 🙂 I hope you like it, Hannah! Denise this salmon looks amazing!! I’m making it this week! Love that it’s a quick 30 minute meal too. I also hate a ton of clean up. I feel like a 30 minute meal should also be an easy clean up too. This looks so amazing Denise! I love sweet chili sauce & this looks like a match made somewhere near heaven!! Going on my to make list very soon! Yeah, I hate when the meal is ready in 30 minutes but it looks like a tornado went through the kitchen. Not quite as wonderful as the ones that are easy to make in 30 minutes! These bowls look amazing – definitely need them in my life soon! For whatever reason, whenever the timer is counting down I get so stressed with meals! I don’t think I’d be a good contestant on Iron Chef haha. This dish is incredible Denise! So many of my favorite meal components. Me neither! Ha ha, thanks, Alyssa! I agree, 30 minute meals can often be more stressful because you’re trying to get it all done so FAST! 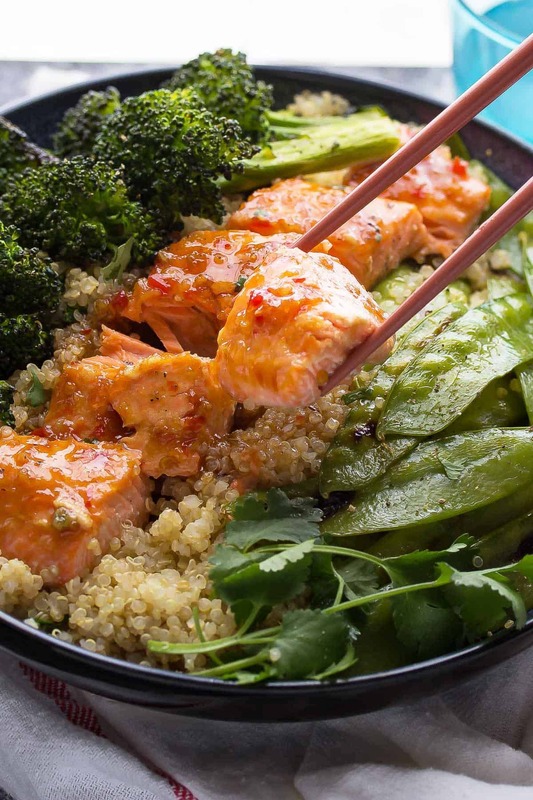 I love that there is some down time in preparing these salmon bowls. 🙂 That sweet chili sauce sounds amazing!! Yes, sometimes it feels like I have every pot I own out! Thanks, Kristine! Ha! I’ve definitely cooked a few 30 minute meals that have stressed me out! This one looks delicious and I love how many different components you can get done in 30 minutes! Everything always has to happen right away and all at once, ha ha! Thanks, Izzy! I love the use of sweet chili sauce in this healthy quinoa bowl 🙂 Such and awesome and easy dinner! Thanks so much, Medha! I’m thinking I need to use it more often! Oh how I love sweet chili sauce!!! haha That stuff is just the best! These bowls sound awesome, especially with all those veggies in here too!! It’s growing on me! I definitely like it when it’s combined with soy sauce for the sweet/salty thing 😀 Thanks, Ashley! Oh I totally know what you mean. Sometimes it seems like the 30 minutes meals are HARDER than making more time consuming meals. I definitely get frazzled racing around my kitchen trying to prep everything. But salmon is the perfect easy and quick dinner. Love these bowls, Denise! YES! Too much pressure! Thanks, Liz! 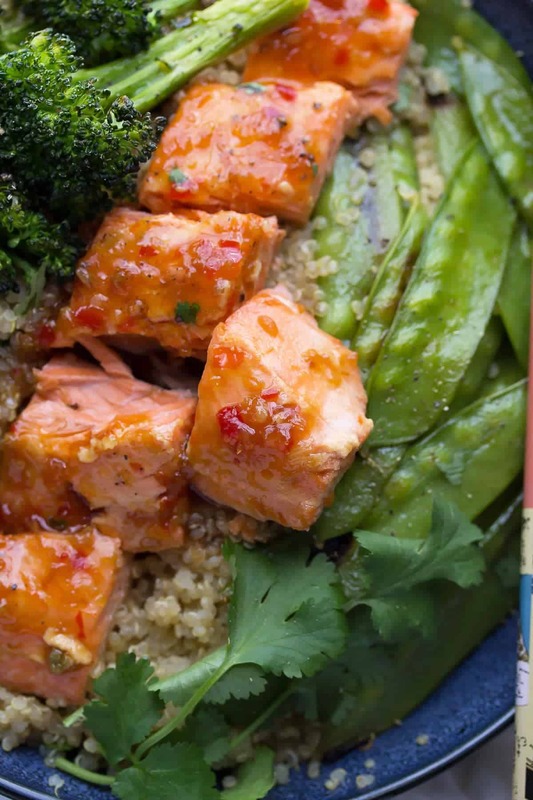 I love salmon and dousing it in sweet chili sauce sounds like an incredible idea! I love all the veggies and quinoa — this is one delicious looking 30 minute meal! Thanks, Marcie! The sweet chili + soy are so good on the salmon! Yeeeep, I’m currently craving this whole bowl and I don’t even care that it’s not even 7am yet. 😉 Holy MOLY, Denise!! This salmon is drop-dead gorgeous! 30 minute Thursdays are the best! This bowl looks delicious! 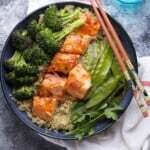 I just can’t get enough of quinoa, especially when salmon is involved!